There are people who possess abilities with their media so profound that when combined with their gift to communicate their understanding, they can move our world. Peter Moore has put himself in the ranks among the greatest craftsmen. Often the hired hit-man of design, he has bolstered the careers of people like Michael Jordan and John McEnroe. Through his creative career he has been able to guide us, the people of the nation, one and all, quietly from behind his creative engineering. He has guided us through his work with Nike, Adidas, and General Electric, among many others. This king of creative guidance has deigned to let us judge his work, to judge the man himself, through his private view and his personal art works. As a person, Moore’s self-effacing nature and sense of humor are two of the first things you notice about his character. Throughout his career he was known for his drive, for achieving his vision. His upbringing in a naval family and competitive spirit drove his work ethic, taught and guided him through endless hours to become a leader in his field. 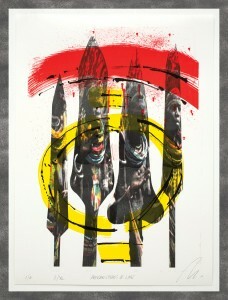 Moore’s personal works center on using the iconic imagery of our society to communicate directly to the people. The messages in his works are not solely aimed at the ivory towers of our world; they are meant to reach the people that walk the streets, who bloody their knuckles to survive. These images speak to as wide an audience as possible. They do not mince words in their meaning and often evoke the iconography of his idol Jasper Johns and are Andy Warholian in the re-purposing of popular images. Though his works deal with the most serious of personal and political issues, his tongue is always planted firmly in cheek. The opinions he expresses are not always easily defended. 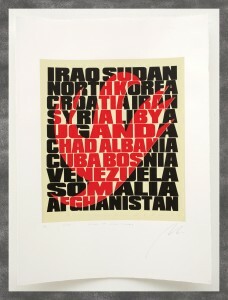 In the case of his 2008 print “The Name Game,” he asks us, through the use of dictatorial images to replace letters in key word phrasing, to take a closer look at the language we use to define our political views. 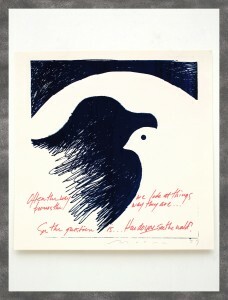 Behind Moore, in the photo below, is the piece “George, what have you done?” Moore displays both his masterful use of popular iconography, and technique as a long-time screen printer, through the black on black print. 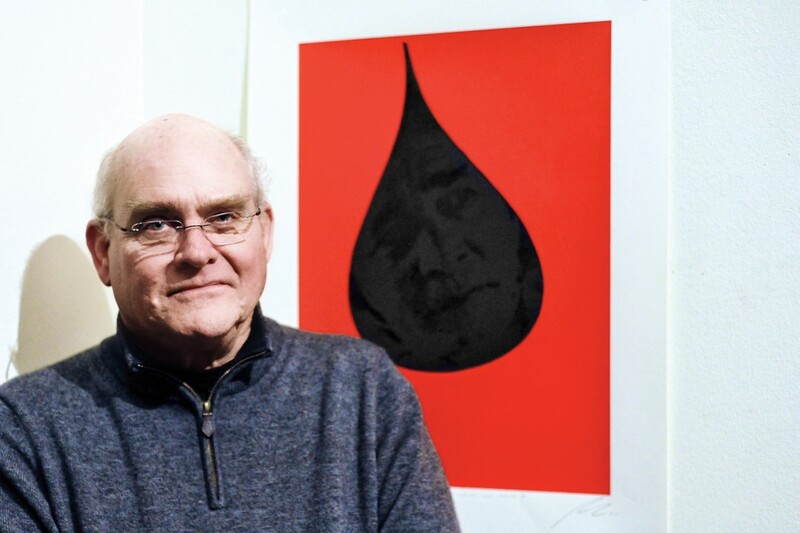 He deftly uses both gloss and matte inks to hide the image of former President George W. Bush in a dripping oil drop, surrounded in a field of red that evokes the image of blood. Almost magically, an image appears as you contemplate its meaning: from just the right angle, you see the former president’s face pop or hide in the sheen of the light. 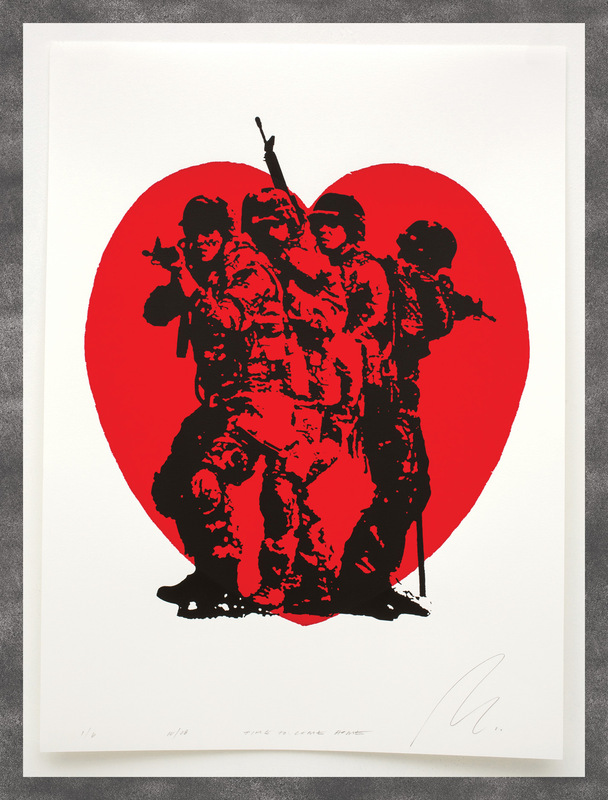 Moore’s artistic work isn’t limited to mastery of iconography and the direct speech of pop art but has also helped to create a new production process. 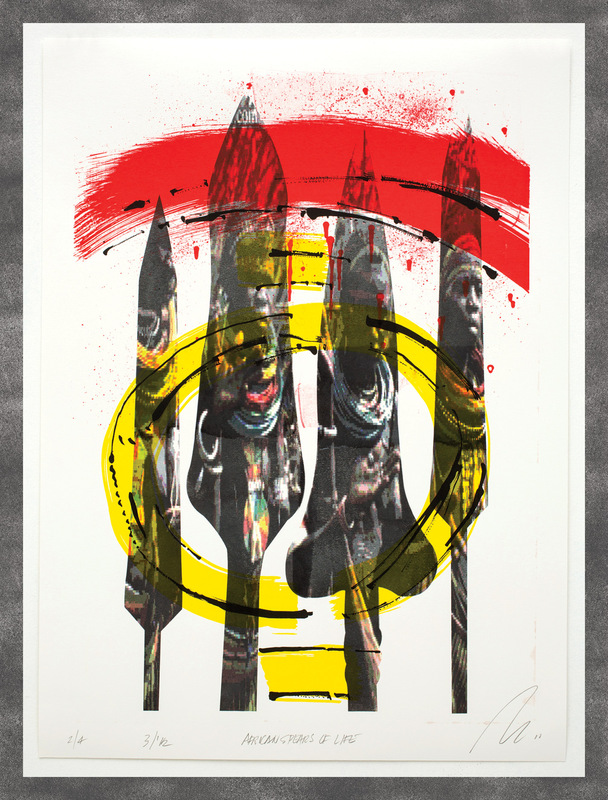 In his African series, in prints such as “Son of a Gun” or “Armies War Violence Death,” Peter uses a personal proprietary process that he devolved himself. Simply stated, the process takes digital media and transfers it, making a unique print which is dictated by hand motion and pressure. I leave you with this final print to chew on, for you to decide just how he may have moved the world and, with it, us.